Now we see dead code too! “I see dead code” – .NET developers all over the world know this slogan due to incredible code analysis feature provided by JetBrains ReSharper. One of the most wanted TeamCity features was to have .NET inspections results right on build server. Starting with the latest EAP you have it! The only thing you need to do to get all the benefits of ReSharper’s analysis right in TeamCity is to add Inspections (.NET) build runner as a build step to your build configuration. 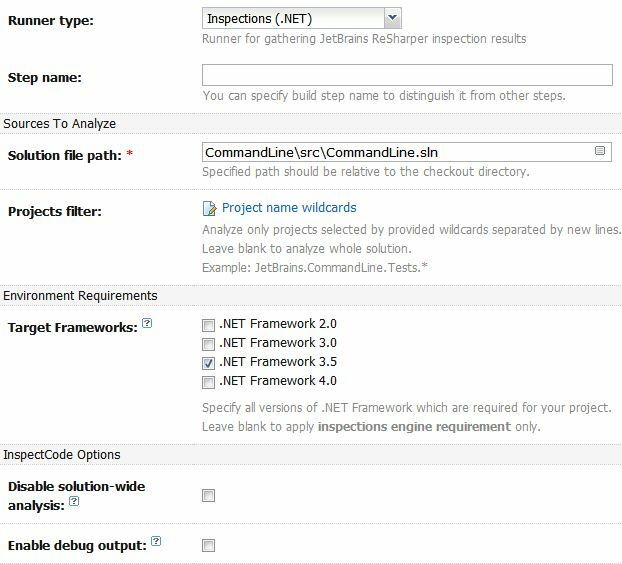 Configuration is quite easy, so let’s just take a look at how the results look when this runner is configured – you can find them at the dedicated “Code Inspections” tab of the build results. 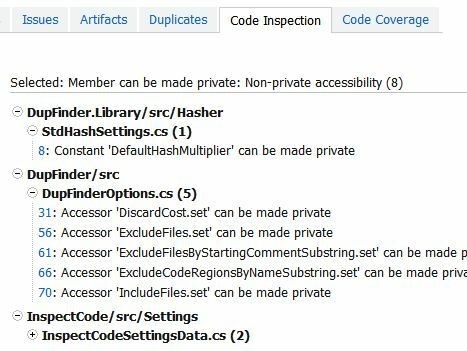 Here we’ve got all the usuall options like exploring overal inspections statistic, opening problematic sources in IDE, viewing inspections description, etc. Moreover, using this build runner together with another fresh feature – build failure conditions, you can update your builds status based on of inspections results. What’s next? First of all, in the nearest future it will be possible to share ReSharper inspections settings profile between your team members and use this profile in TeamCity build. More to come, you will be able to ask TeamCity to run custom inspections related to your code base as well. As always, your comments and feedback are very much welcome. To try it, install TeamCity 7.0 EAP build. 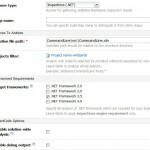 This entry was posted in EAP, Features and tagged .NET, build failure conditions, build runner, inspections, R#, Visual Studio. Bookmark the permalink. 3 Responses to Now we see dead code too! Does this require a ReSharper license? If I use a FxCop Build runner in the same configuration, will the inspection results of the FxCop runner and the ReSharper runner combined? TeamCity will not require ReSharper license for this functionality, but it will not be possible to use command line inspections tool outside of TeamCity. Pascal, sorry for delay in reply. License policy is under discussion. We will notify you about results. In regards of combining several inspections runners inside of single configuration. TeamCity will produce inconsistent results in this case. Please watch related issue in our tracker (http://youtrack.jetbrains.net/issue/TW-14260) for status change.